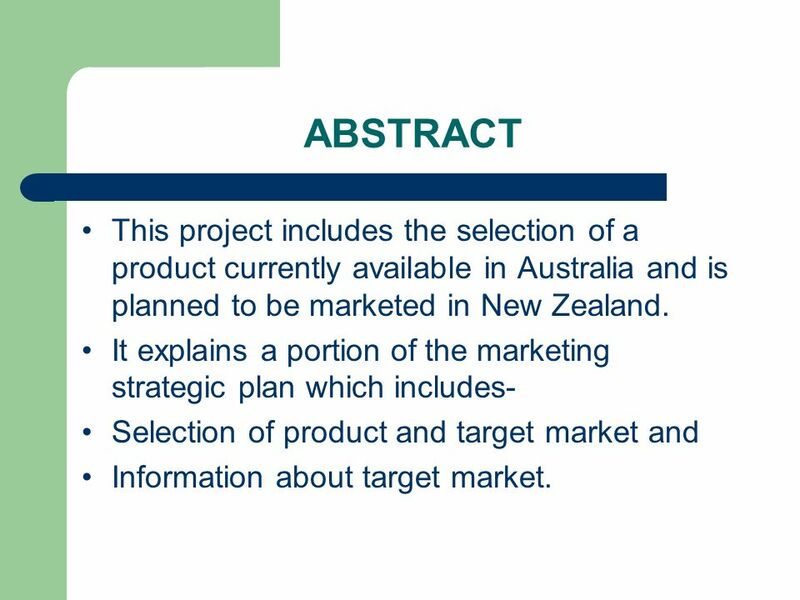 2 ABSTRACT This project includes the selection of a product currently available in Australia and is planned to be marketed in New Zealand. 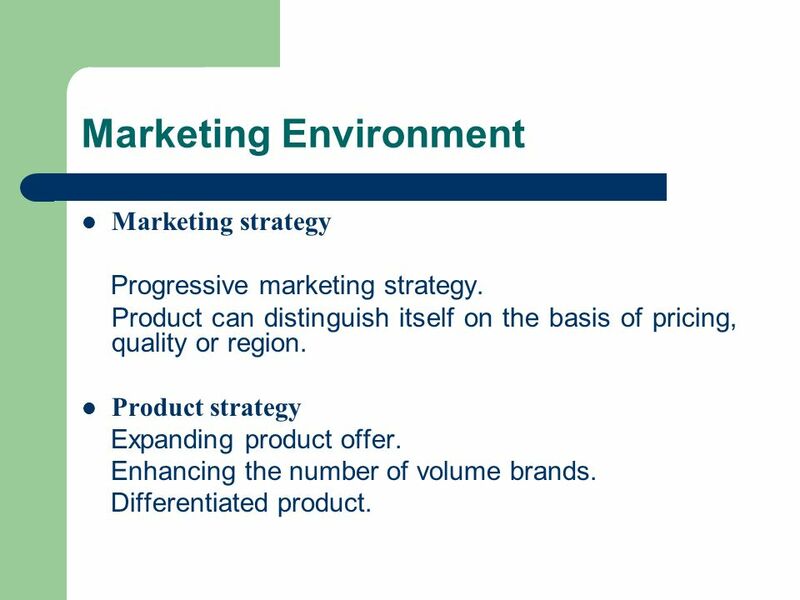 It explains a portion of the marketing strategic plan which includes- Selection of product and target market and Information about target market. 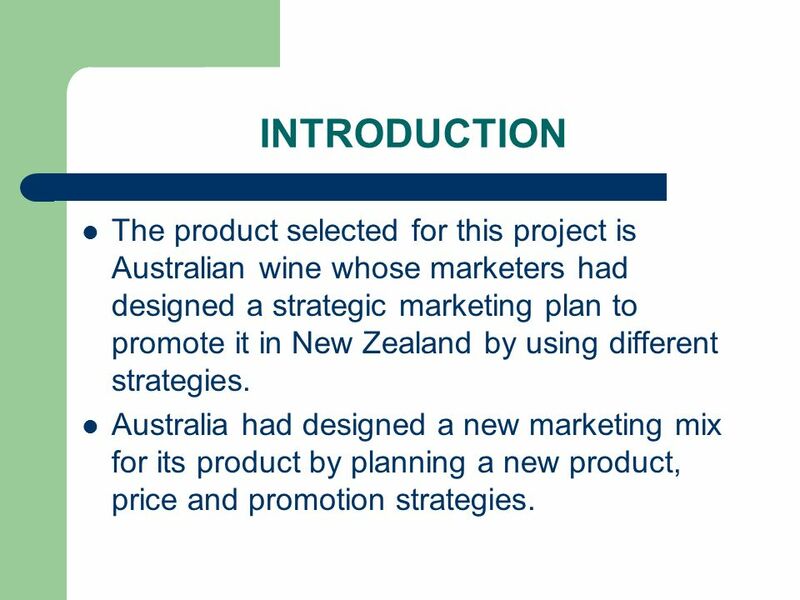 3 INTRODUCTION The product selected for this project is Australian wine whose marketers had designed a strategic marketing plan to promote it in New Zealand by using different strategies. Australia had designed a new marketing mix for its product by planning a new product, price and promotion strategies. Product - Australian Wine Target Market - New Zealand Reason of selection – In global wine market, people are shifting from basic to premium bottle wine. The young consumers in the old world wine countries are becoming interested in new world wines. Product The product which is chosen for this project is Australian wine. Wide verities of wines are offered by Australia. Australian wine has a huge potential market in other countries. Target Market New Zealand is the country which has been chosen to market the product. Reasons: The wine culture is very well developed in New Zealand. New Zealand has a consumption of 19.4 liters per capita. 53% of the total wine production is accounted by the exports. Major consumers of the red wines are from Australia. One of the world’s most liberalized and flourishing free trade agreement has been designed between Australia and New Zealand for trading with each other. Opportunities – New Zealand provides a large size export market. It gives opportunities to develop mutual recognition. International Trade All details regarding the marketing, regulatory and legal information are included in the Export Market Guide entry for New Zealand. At the same time, it also contains information dealing with the duties & taxes, labeling requirements and an overall view of the Australian wine in New Zealand. Opportunities The major opportunities for wine exporters from Australia include: Red wines have an established profile in Australia. White wines are available at under A$8 in Australia. The importers are still in search for brands that are famous and well-distinguished in Australia despite a large number of Australian labels already established in New Zealand. There has been a significant increase in the sales of Australian wine ranging between A$7 and A$11. As a result, it has been believed that the consumers would try to purchase premium Australian Chardonnays, Semillons and Rieslings and gradually develop a liking for the varying taste characteristics. The popularity of Pinot Noir and Pinot Gris is steadily increasing in New Zealand (Australian Government: Austratrade 2008). 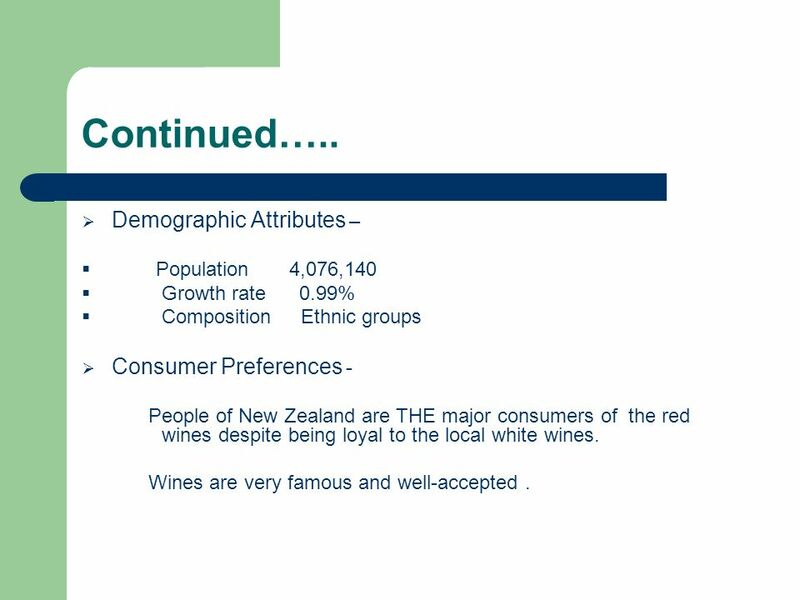 Population ,076,140 Growth rate % Composition Ethnic groups Consumer Preferences - People of New Zealand are THE major consumers of the red wines despite being loyal to the local white wines. Wines are very famous and well-accepted . Demographic Attribute The country has a population of about 4,076,140 with a growth rate of 0.99% and is basically composed of ethnic groups like the Maori, Europeans, Asians, Pacific Islanders, etc. Documented preferences of the consumer A shift from the basic to premium bottle wine is observed in the global wine market. Consumers are moving from the white to red wine varieties but there is still an increased demand for a high quality white wine. The young consumers in the old world wine countries are becoming interested in the new world wines. In New Zealand, the wines from Australia are very famous and well-accepted by the locals. Australian reds are viewed to be superior as compared to the New Zealand reds, despite the good quality of New Zealand whites. However, the export volume of the white wine to New Zealand has decreased steadily as a percentage of the total volume in Constant efforts are made by the Australian companies to gain entry into the white and sparkling wine segment, particularly in the lower priced segment. 7 Competitiveness of Australian Wine…. Strong market research. Expertise in Winemaking. Proficiency in technology utilization. Knowledge about the regional languages. Recruitment of consultant and an expert to handle exporting. Selection of a distributor, who has already sold the export material. Market research of Australia is spread over the USA, Canada and New Zealand. Australia is having expertise in Winemaking process and utilization of technology. 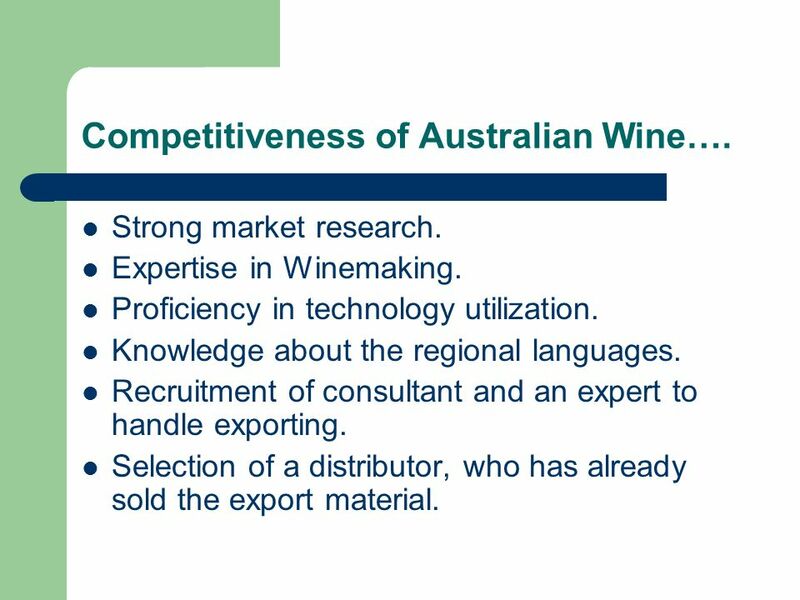 Australian wine industry had formed a group that is well acquainted with regional languages of the research areas. Recruitment of best human resources including a consultant and an expert to handle exporting. Australian wine industry is used to select a distributor who has already sold the export material in the chosen market. Any good that has a 50% or more content from Australia can enter New Zealand without paying any duty. The products labeled at domestic level meet export requirements. Trade Policy Goods and services tax (GST) is applied at 12.5 per cent. 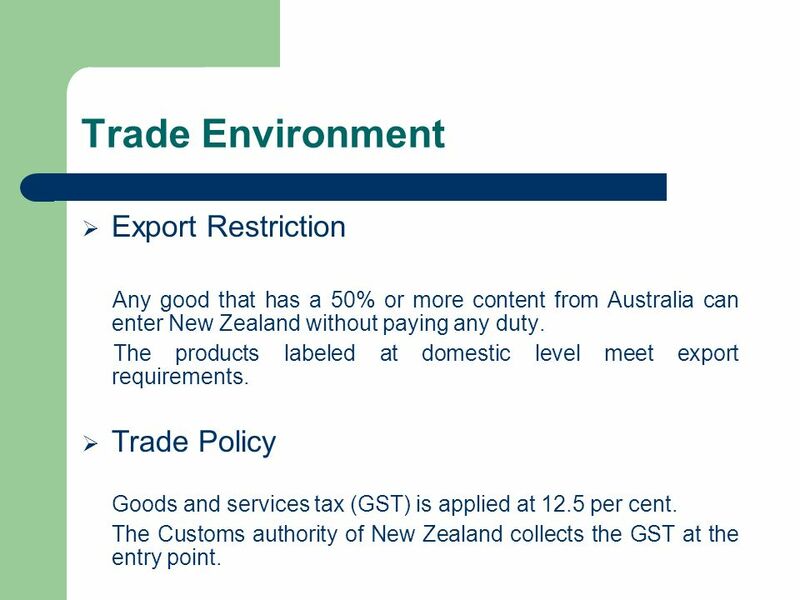 The Customs authority of New Zealand collects the GST at the entry point. Export Restriction As per the Australia New Zealand Closer Economic Relations Trade Agreement, it is agreed that any good that has a 50% or more content from Australia can enter in New Zealand without paying any duty. In addition, the products labeled at the domestic level, also meet the requirements for export to New Zealand. The responsibility for administering the food regulations has been entrusted upon the New Zealand Food Safety Authority. On the other hand, the Customs Service of New Zealand holds the responsibility for regulating the imports to the country. All details regarding the marketing, regulatory and legal information are included in the Export Market Guide entry for New Zealand. 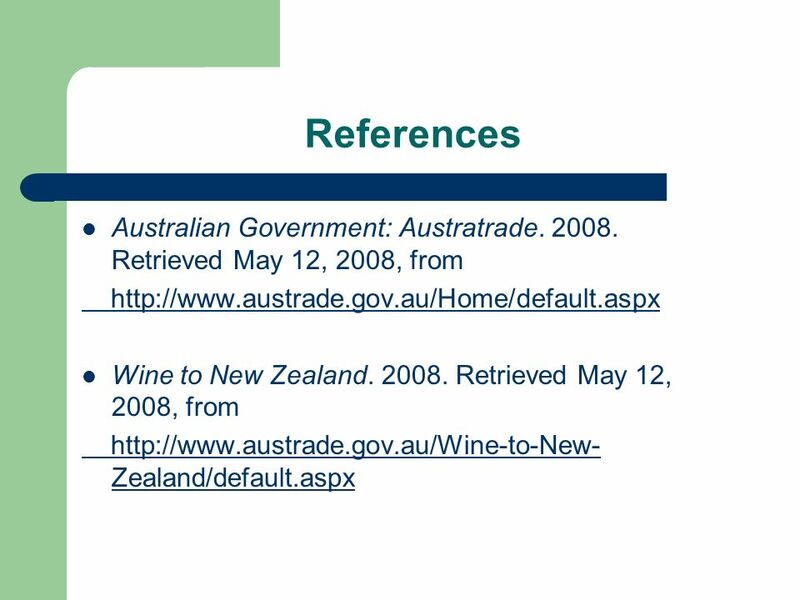 At the same time, it also contains information dealing with the duties & taxes, labeling requirements and an overall view of the Australian wine in New Zealand. 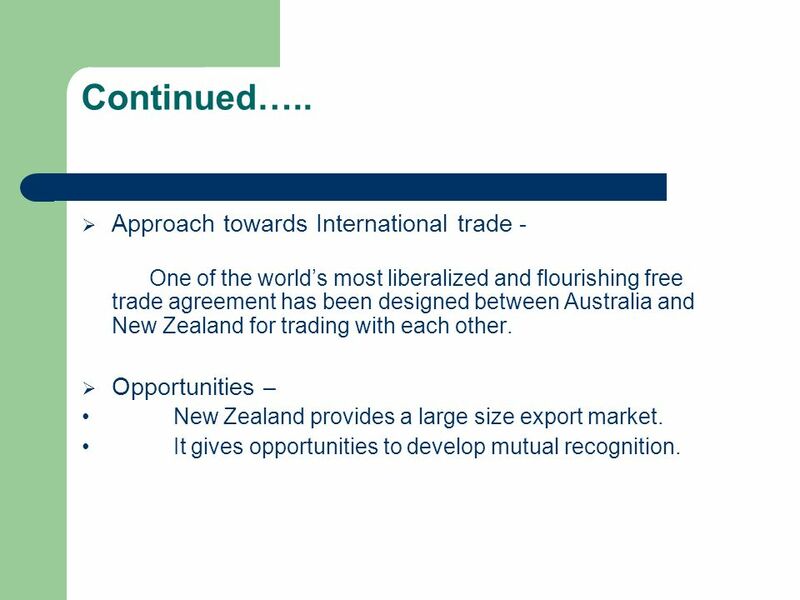 Trade Policy The economy of New Zealand is mixed in nature and is based on the principles of free market. The country has a huge agricultural sector, which is well supported by the service as well as the manufacturing industries. As per the national treasury department, 33% of the total output is exported suggesting that it is a very trade-oriented nation. It is also estimated that business and household spending would be the major sources of growth in the coming years, as the exports are growing at a slower pace. To all the products, including the local as well as imported, Goods and Services tax (GST) is applied at 12.5 per cent. The Customs authority of New Zealand collects the GST at the entry point prior to the release of the goods (Australian Government: Austratrade, 2008). Marketing strategy Progressive marketing strategy. Product can distinguish itself on the basis of pricing, quality or region. Product strategy Expanding product offer. Enhancing the number of volume brands. Differentiated product. 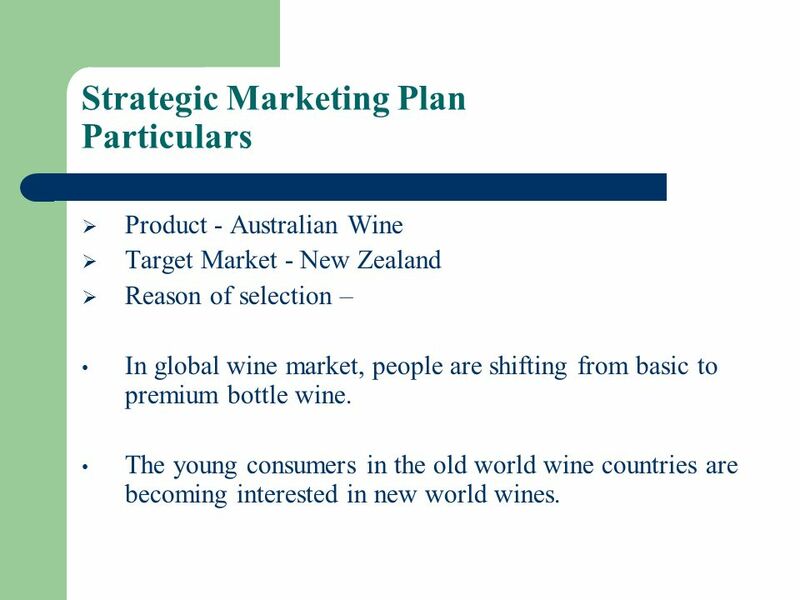 Marketing strategy Market entry The Australian wine industry follows a progressive marketing strategy in New Zealand. It is also essential for the wine companies to distinguish themselves from various available brands on the basis of pricing, quality or region. It has been also observed that the well known Australian wines or the internationally renowned brands enjoy a high rate of success in penetrating the markets of New Zealand. In order to complement their current offerings, local representatives generally look for well-funded and recognized brands. However, it is very difficult for small and unsupported brands to enter the markets of New Zealand (Wine to New Zealand, 2008). It is also essential to undertake marketing support and this is usually funded by the exporter. In fact, without any kind of assistance, a brand is not likely to gain space on the shelves of the supermarket or the traditional retailers. As the exclusive wine retailers are unable to compete on the basis of price, they are in search for exclusive products or deals to offer their consumers. Product Strategies The challenge of global retail and distribution is met by expanding the Australian product offer, ensuring the availability of established brands and enhancing the number of volume brands in the premium segments. These strategies also need that the grape growers should be aware of the significance of grape quality, price and style specifications. Markets: The industry investment needs to be expanded for joint promotion of the wine brand Australia by assigning promotional responsibility to one organization. Product Packaging There are labeling requirements for products exported to the New Zealand. Information must be in Maori or English. Specific requirements are: Name of the product and brand on the main surface of the product. List of ingredients in descending order of product composition with added water along with added colors. Net weight in metric units. Name and Address of the manufacturer. Country of origin. Lot number. Expiry date. Percentage of Alcoholic content- Labeling for alcoholic beverages must indicate the approximate alcoholic content. 10 Continued….. Pricing Strategy Competitive basis. Well supported by current level. Promotional Strategy Promotional pricing. Advertising in consumer magazines. Reviews in lifestyle publications. Wine testing. Other traditional marketing activities Pricing strategy In New Zealand, it has been observed that the Australian wines are generally priced on a competitive basis, which is well-supported by the current strengthening of the New Zealand dollar against the Australian currency. Market price Average retail price ranges from per bottle according to the varieties (Wine Gallery, 2005). Promotional Strategy In order to support a product in New Zealand, promotional pricing, advertising in consumer magazines, reviews in lifestyle publications, wine testing and other traditional marketing activities are recommended. Distribution channels used for high volume and well established brands, Supermarkets and the traditional liquor trade are ideal channels. Moreover, for premium brands, specialist wine retailers and on premise restaurants might prove to be good distribution channels. However, it is very difficult for the small suppliers of the Australian wine to locate proper distribution channels in New Zealand. The main reason behind this is the lack of adequate funds and fierce competition from the large no. of existing brands (Wine to New Zealand, 2008). Reason of difference - Quality-conscious consumers. - Highly driven by the reputation of a brand. - Strengthening of New Zealand against the Australian currency. - Fierce competition from local brands. 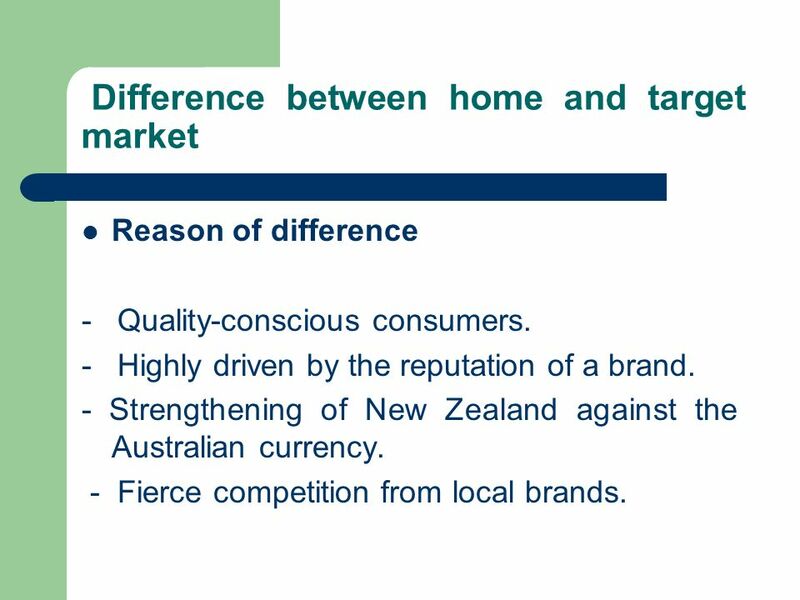 Current strategies that are being used in New Zealand are different from the home market of Australia due to difference between their Demographic environment Political & Legal environment Social environment Cultural environment Economic environment These are some general reasons for different strategies between home and target market. There are some more specific reasons for different strategies used for home and target market: Consumers of the target market are very quality conscious about wine so it becomes necessary for the Australian wine industry to change its current strategies in New Zealand. Consumers of wine in New Zealand are highly driven by the reputation of the brand; they don’t prefer local brands. Current strengthening of New Zealand dollar against the Australian currency forces Australia to change its strategies in the target market. The Australian wines mainly face competition from local brands like the Liquor land Top 100, Royal Easter Show Wine, New Zealand International Wine Show and International Chardonnay Challenge, so it is better to enter the target market with improved strategies. 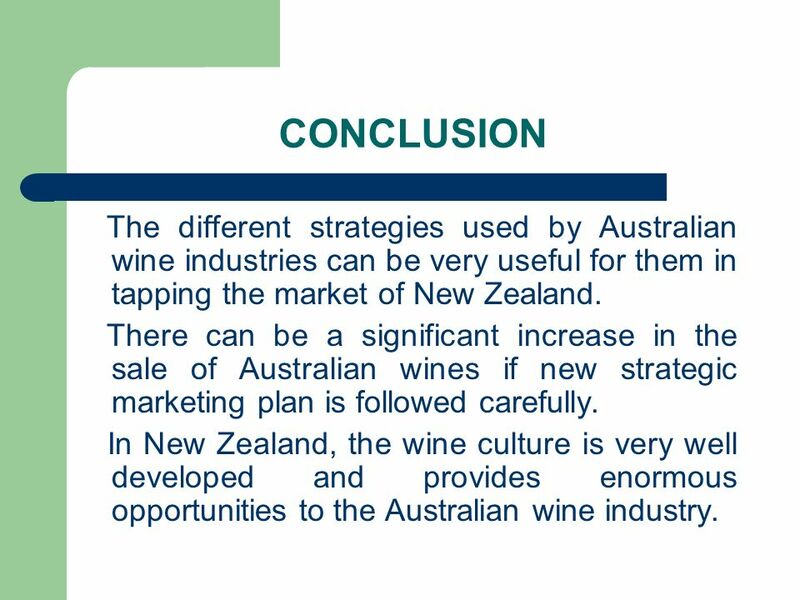 12 CONCLUSION The different strategies used by Australian wine industries can be very useful for them in tapping the market of New Zealand. 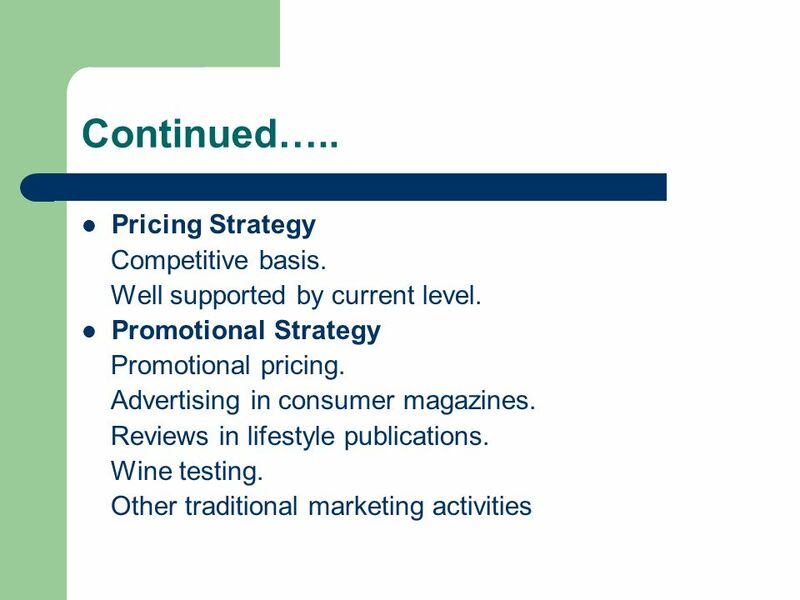 There can be a significant increase in the sale of Australian wines if new strategic marketing plan is followed carefully. In New Zealand, the wine culture is very well developed and provides enormous opportunities to the Australian wine industry. 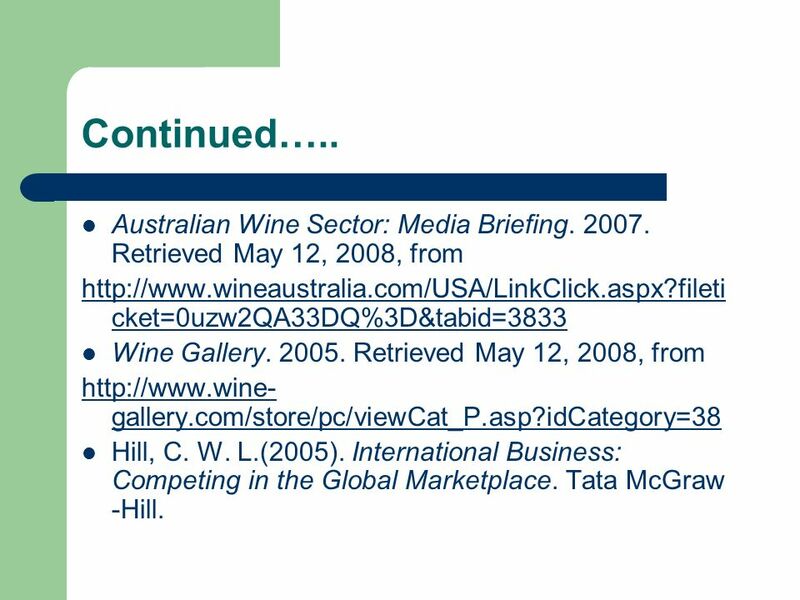 14 Continued….. Australian Wine Sector: Media Briefing Retrieved May 12, 2008, from Wine Gallery Retrieved May 12, 2008, from Hill, C. W. L.(2005). International Business: Competing in the Global Marketplace. Tata McGraw -Hill. 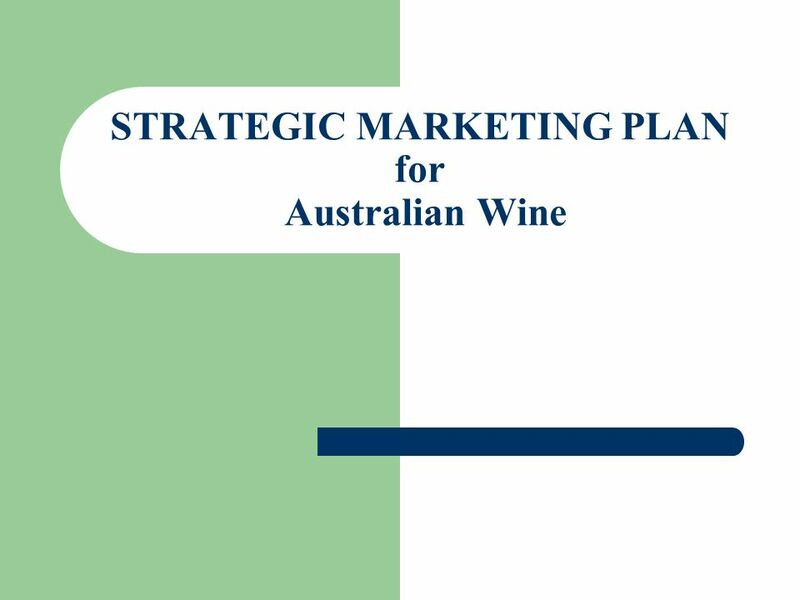 Download ppt "STRATEGIC MARKETING PLAN for Australian Wine"
Café de Colombia Nick Kordesch Christina Rosa Jennifer Su Rebecca Wang. USMEF General Session U.S. Meat Export Federation. Global E-Commerce Back to Table of Contents. ValueNomics THE TRADE FUNNEL. DEMAND SIDE ANALYSIS MRI SCAN SUPPLY SIDE ANALYSIS CUSTOMER VALUES ANALYSIS VALUE SYSTEM ANALYSIS TRADE PROMOTION TRADE. Sharing the Harvest: The success of Canada’s Grape & Wine Industry – A British Columbian Prospective. Copyright © 2009 Pearson Education, Inc. publishing as Prentice Hall 16-1 Part Six Managing International Operations Chapter Sixteen Marketing Globally.